So much fun you'll scream. 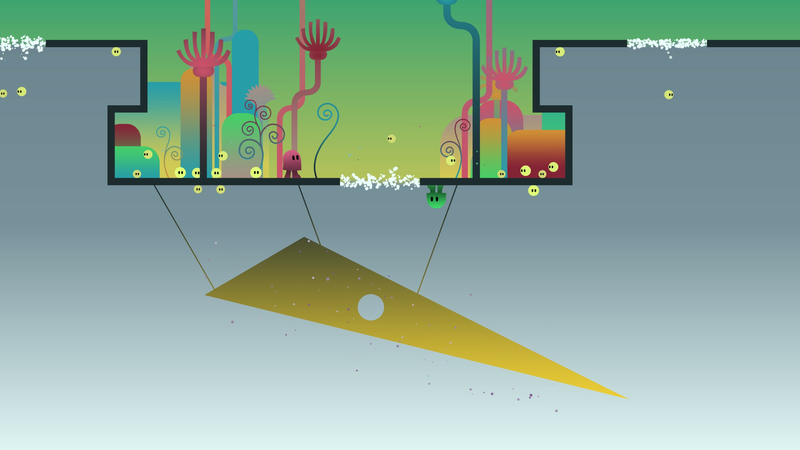 ibb and obb is one of the best co-op puzzle games of the last few years. It looks innocent and sounds a bit frightening, but once you sit down to play it with a friend, you, too, shall be hooked. 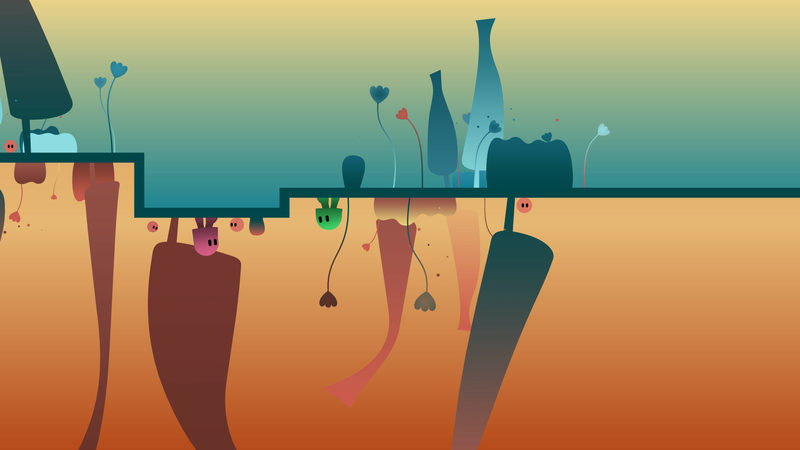 Developer Sparpweed has created a game that's a perfect combination of head scratching puzzles and reflex testing platform sequences. It's filled with surreal artwork, curious characters, flawless physics, mysterious landscapes, and puzzles that were obviously created by some puzzle-constructing robot from the future. To top it off, ibb and obb's co-op play is absolutely seamless, providing the perfect atmosphere of teamwork with just a touch of playful competition. 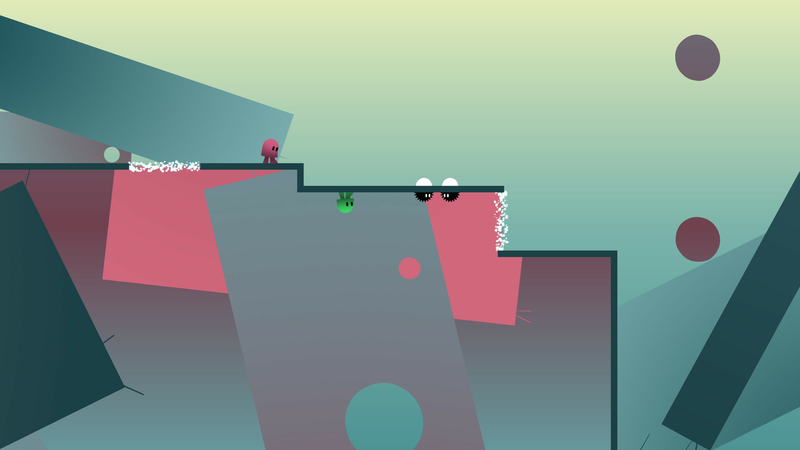 The basic premise of ibb and obb is to work through a series of gravity and physics puzzles while dealing with enemies and collecting shiny diamonds. The controls are confined to a basic jump and walking left and right. No ducking, crawling, shooting, hand-holding somersaults or any of that nonsense. 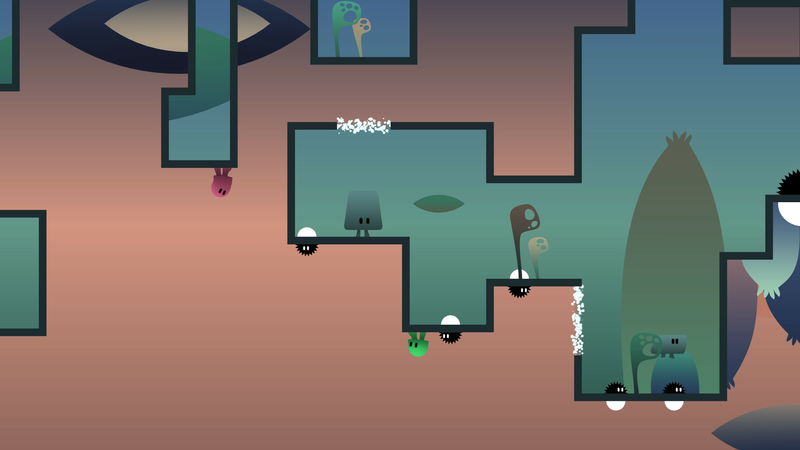 Co-op mode gives each player a temporary line to draw on the screen, useful for pointing things out or illustrating a plan of action for the other player. But beyond that, all you need to think about are the puzzles. Trust us when we say you'll be thankful there aren't any other distractions. 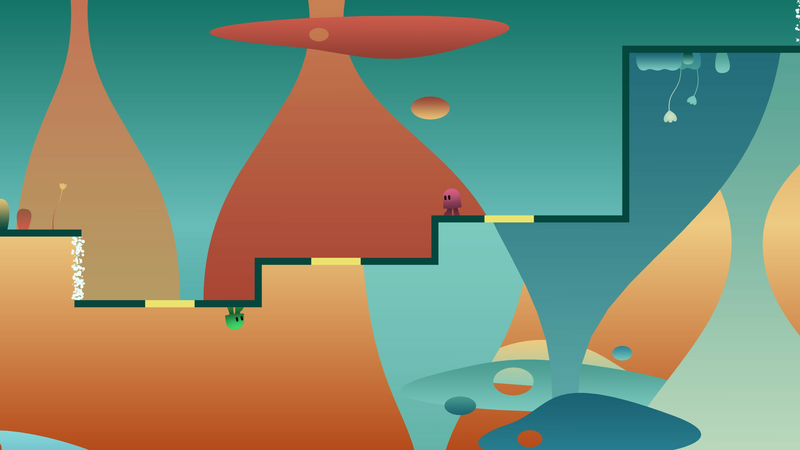 The central mechanic of ibb and obb's puzzles are gravity gates. When a player steps through a gate he or she is instantly affected by flipped gravity. So, for example, if you jump through a horizontal gate, you'll be walking on the underside of the platform you were previously on top of. Vertical gates do the same thing with left-right orientation. There are also color-specific gates that allow either ibb or obb through, blocking the other character like a standard wall. Much like Portal 2, momentum is preserved when you jump through a gate. This creates situations where you can leap from high platforms, pass through a gate and continue your jump with gravity in the opposite direction. 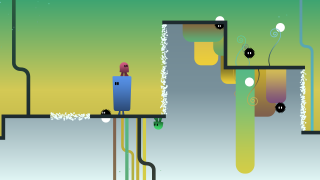 Many of the puzzles are designed around getting enough height so you can put this momentum switching to good use. Enemies present their own unique challenges, many of which are pure old school trial and error in nature. Foes are dark and spiny, usually hopping or sliding in a confined space and minding their own business (though some do chase you). You can't do much but avoid them at first, timing your jumps to just barely clear their pointed heads, hopping on your buddy's head for a dual jump, or sliding underneath them with but a few pixels worth of clearance. Defeating them, of course, requires teamwork. 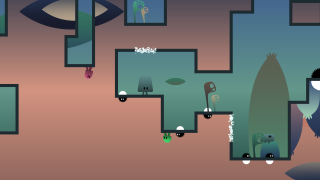 Each enemy has a white orb on its obverse side. 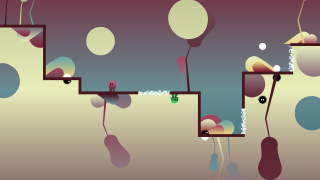 Get either ibb or obb to touch that orb and the enemy explodes into happy crystals you can collect. 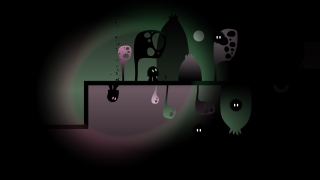 Throughout our time with ibb and obb we didn't find an enemy that couldn't be defeated, but pulling off the tricks necessary to destroy them can be taxing, especially when you can just run by without fussing with it. Getting a high score for diamonds collected is nice and all, but sometimes you're just happy to be alive. 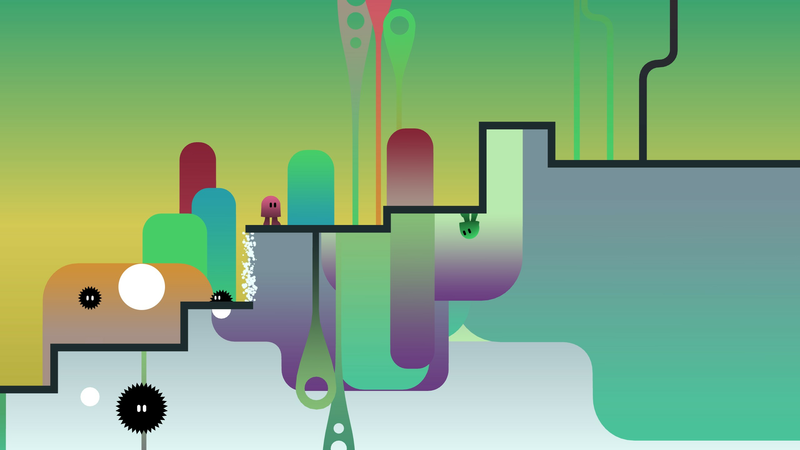 Puzzle design is what makes ibb and obb such a perfect game. Each small section is separated from previous puzzles, allowing you to focus on the task at hand. The most innocuous setups often provide the most perplexing puzzles, leading you to situations where your brain turns a simple solution into some convoluted series of events. In addition, you'll also make use of moving polygon characters, jumping platforms, and the little tennis ball-like creatures. Everything on the screen has a purpose; there are no red herrings. 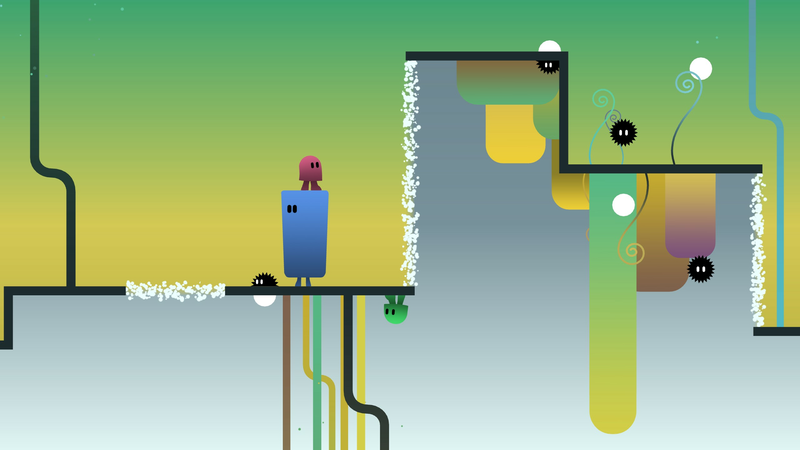 Most puzzles are cerebral in nature, challenging you to get both ibb and obb to the right location at the right time. But some are all about timing. 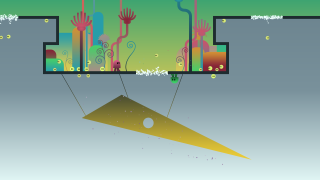 One in particular requires players to trick some enemies into leaving their position while the other player jumps across a series of upside-down platforms. Even the slightest mistake in timing ends the whole thing. 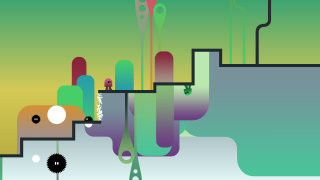 Fortunately, ibb and obb never punishes you for failure. When you die you simply respawn at the beginning of that puzzle. 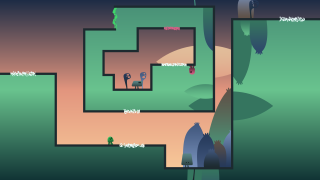 There are a couple of race-like sequences, a few jump puzzles, crazy bubble-floating levels where you have to coordinate your moves with the other player so you can both make it across, and even special challenge levels you have to locate before you can attempt. They're absolutely worth the effort, though! Single player mode is available in ibb and obb, but we'll be honest and say it isn't a fraction of the fun that co-op provides. 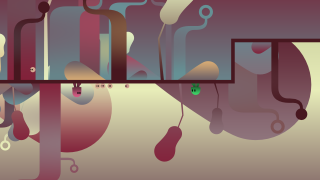 Solo controls put ibb on the left analog stick and obb on the right. You can move them simultaneously, but it takes a long time to get your brain to acclimate to the scheme, especially when obb is to the left of ibb. If you can't do co-op with ibb and obb, you might not want to do it at all. It's a social experience for sure. It's amazing how entrenched the left to right, top to bottom layout has become in the video gaming genre. 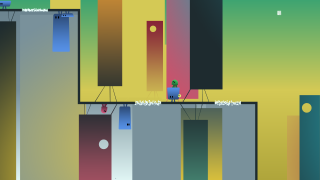 Perhaps it's just more natural for anyone who reads in the same direction, but when ibb and obb turns a simple puzzle on its head, suddenly the challenge is twofold. 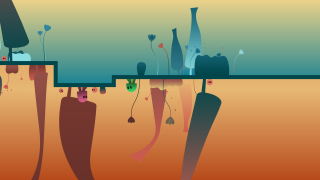 Throw in an inverted and mirrored puzzle that requires precise jumps coordinated with your co-op friend where a single mistake starts the puzzle over again and you can begin to understand how difficult this game can get. But not frustratingly so. The solutions are always right in front of your face, you just have to try different approaches and see what works. 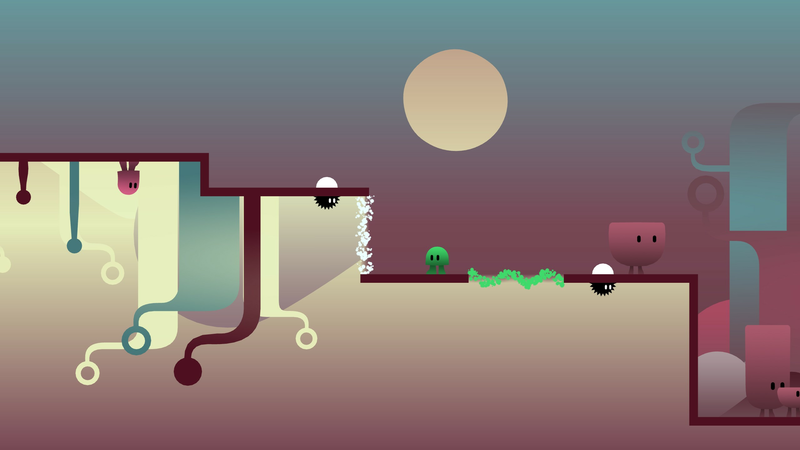 ibb and obb does a lot using very few elements. A platform here, a gravity inverting gate there, and two adorable protagonists who take naps if you let them stand still for a few moments. The artwork highlights the game quite eloquently and provides a lot of character to the stages, backgrounds and bit players. 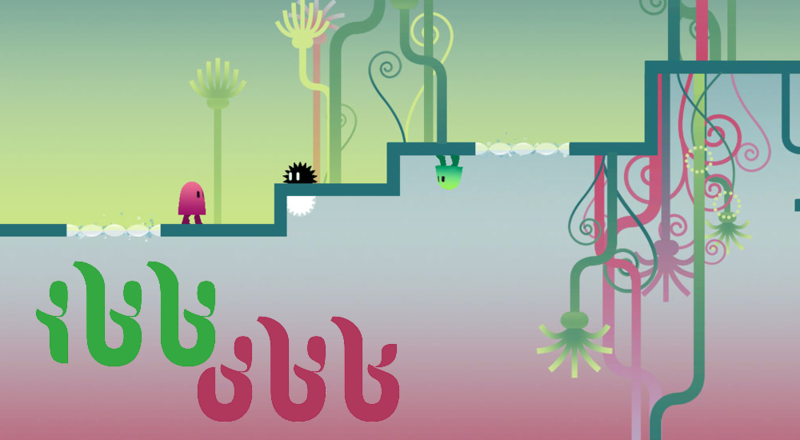 All in all, ibb and obb is a game you won't regret playing. It's six or so hours of pure cooperative puzzle solving perfection. 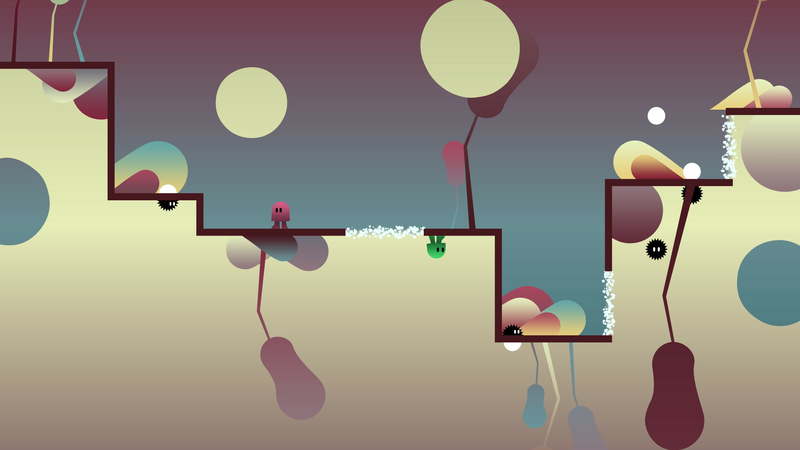 The Co-Op Experience: Play as ibb and obb in this double gravity defying platformer.